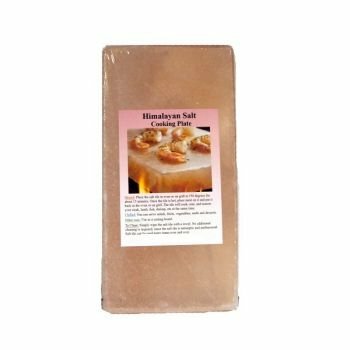 This is a fabulous tile made of Himalayan Salt that can actually be used for enhancing the taste of hot or cold foods. For Cold Foods: Place salt crystal tile in the refrigerator for one hour to chill. The sale will retain its temperature for 2-3 hours. When chilled you can serve salads, fruits, vegetables, sushi and desserts. For Hot Foods: Place salt tile in oven or grill at 350 degrees for about 15 minutes. Once the tile is hot, place meat on it and put it back in the oven or on grill. The tile will cook, sear, and season your steak, lamb, fish, shrimp, etc at the same time. To Clean: Simply wipe the salt tile with a towel. No additional cleaning is required, since the salt tile is antiseptic and antibacterial. Do not soak or leave in water. Follow all safety instructions, do not overheat. Natural cracks in the salt are common. Salt tile can be used many times over and over. Measures 8" x 4" x 1".